The bi-modal distribution (graphic to the right) continues to generate interest in the blogosphere. See, e.g., Greg Mankiw, Right Coast, Broken Symmetry. The chart summarizes the starting salaries for lawyers who graduated from law school in 2006. One reason the bi-modal structure is so jarring is that it demonstrates that measures of central tendency, such as average or median, are not necessarily reliable guides for law students' future earning power. In conventional labor markets, that disconnect is rare. NALP recently dug into its archives to determine whether this stratification is a persistent feature of the entry level law market. See NALP Bulletin (Jan. 2008). It turns out that 15 years ago, the market followed a much more traditional distribution. 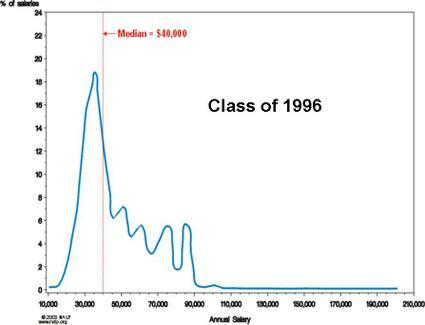 The chart below summarizes the salaries for the class of 1991. The rightward skew is a bit more pronounced and the area under the $75K to $85K range is becoming more substantial. A more seismic shift is seen in 2000 (below) with the emergence of a second mode at the $125K price point. At the height of the Internet boom, a remarkable 14% of all entry level lawyers took jobs at the $125K level. According to NALP, "never before had a single salary so dominated the landscape." 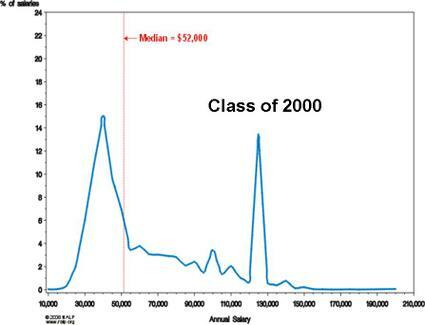 Under the 2006 bimodal distribution (see chart above), 44% of graduates received entry-level salaries in the $40K to $60K range; yet, the second mode moved further to the right ($135K to $145K) and grew to 17% of all graduates. On one level, law firms' reluctance to tinker with the Cravath system makes perfect sense--it has produced large incomes and huge profits margins for decades. Further, 30 or 40 years ago, the vast majority of firms that would eventually become the Am Law 200 were, in fact, "white shoe" firms within an overwhelmingly regional corporate legal market. In particular, places like Cleveland, Detroit, Pittsburgh and St. Louis garnered their share of elite law school graduates. In the early 1960s, sociologist Jack Ladinsky found that 73% of Detroit lawyers working in law firms (i.e., not in solo practice) went to one of five national schools: Harvard, Yale, Columbia, Chicago, or University of Michigan. See Ladinsky, Careers of Lawyers, Law Practice, and Legal Institutions, 28 Am. Sociology Rev. 47, 49 (1963). You can bet this pattern is radically different today. As these regional law firms morphed into the Am Law 200, their partners remained psychologically wedded to their own perceptions of eliteness. In the ensuing salary wars, these firms slavishly paid the prevailing rate rather than signaling to the market that the firm had become "second rate" (a term used by a Proskauer Rose partner in rationalizing the higher pay). In turn, the laws of supply and demand produced the bi-modal distribution. The Results or Résumés paper draws upon two pieces of market data to demonstrate that a large proportion of large corporate law firms have to re-evaluate their business models: (1) stunning uniformity of associate entry level salaries amidst large, growing disparities in profits per partner; and (2) evidence that firms are becoming stratified by premium versus non-premium practice areas. 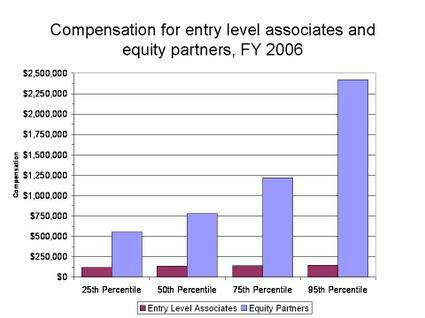 Regarding the disconnect between associate and partner pay, the bar chart below compares associate starting salaries with profits per equity partner at the 25th, 50th, 75th, and 95th percentile breakpoints in the Am Law 200. As the paper documents, over the last several years, profits are going up at all levels of the Am Law 200; they are just going up much faster for high PPP firms. Obviously, when firms at the top of the heap (95th percentile) pay higher salaries and bonuses, it is quite a stretch for firms at the 25th percentile to match. The money has to come from somewhere. If it comes out of the draw of a rainmaking partner, he or she has a strong incentive to seek greener pastures. That is risky; but to the majority of the partnership, departing from the Cravath model seems equally perilous. Over the last decade, virtually all large firms have adapted by increasing leverage (i.e., the ratio of total lawyers to equity partners). But higher leverage can also undercut associate morale and loyalty. So for firms at the bottom of the PPP distribution, the salary wars are one hell of a vise, particularly as the economy heads south and they are stuck with a $160,000+ cost structure. Yet, for many firms, there is second trend that is much more troubling. Based on a dataset of lateral partner mobility within the Am Law 2000, it is possible to tease out a relative hierarchy of practice areas. The table below, which covers the 2000 to 2005 time period, orders legal specialty by differential profits per equity partner (PPP) between the firm a partner left and the firm he or she joined. In the long-run, firms without a optimal mix of premium practice areas will have a hard time sticking with the Cravath system. Increasingly, corporate clients are refusing to have their cases staffed by expensive first- or second-year associates who don't know very much and tend to leave. Hence, the training the clients are allegedly paying for has little or no future payoff. In other words, for many large law firms, the wheels of their hallowed business model are falling off. During this period of denial, every firm's short term strategy is to work harder, promote fewer lawyers to equity partner, and de-equitize as needed. Marc Galanter and I chronicle the unremitting nature of modern large firm practice in our forthcoming Elastic Tournament article. If you have any doubt about the inevitability of change, read this seminal speech by Cisco GC Mark Chandler. Fortunately, the Results or Résumés paper lays out a solution for any law firm willing to try something new. The psychological barriers, however, are much larger than the logistical or financial. I will blog on this topic in a subsequent post. People have now very good Internet sources to order the phd thesis and hot research about this good topic at the experienced thesis writing service. The smart outcome as this good topic will be included in custom dissertation or in the buy thesis to buy research papers on line from the essay writing services. Lawyer compensation is also skewed at more senior levels. Big Law partners - even service partners -- make in the millions, while others (small firm and solo, in-house, or government) in mid-career muddle along in the $100-$300,000 range, even in a high-salary market like New York. And there is no means of entry to the big firm system for those senior lawyers, regardless of where they went to law school. This type of gross inequality for people with similar backgrounds and experience indicates something deeply sick about the legal services economy -- as does the practice of offering first years "money for nothing" to avoid rescinding offers. How long will the clients continue to pay for this irrational excess? I'm always amused by quotes from law firm partners saying basically "higher salaries are a result of a labor shortage. if we could find more top level legal talent, we'd hire them. as it is, most people going to large law firms are ill-suited for it and wash out." it makes sense in a way, since the lsat dominated law school admissions process mostly eliminates the value of any characteristic other than abstract reasoning skills. we should expect large firms to be hungry enough for more true talents that they throw money at the problem. I wonder whether the actual legal work at larger firms tends to be more complex and difficult, such that the larger population of young lawyers who lack the mental chops go to work for the firms that pay less for less mentally demanding work. of course, it might be nothing like that. Finally, I want to point out that bimodal distributions are not inherently unstable. I think you will find that a bimodal distribution for "age at baptism" has existed in America for some 200 years now. lawyers just want to keep up with investment bankers. it's an esteem thing. they can't believe that for their superior education and intellect and all the glory they bathe themselves in that some hustler with a spreadsheet can collect a 0.2% fee for "advising" a multi-billion dollar merger, no matter how much time it takes. lawyers sweat to earn the same money by creating some stupid system where they have to bill for every hour of every day of every year and call it "work." what a joke. "There are only so many smart people going into law- and almost all attend a top 20 law school." That sentiment explains every chart in this post. As law schools and students pursuing law multiply, the traditional elitist finishing schools face increasing competition from bright, innovative upstarts. The response from the ivory tower has been to tout their luxury services and encourage an increased focus on rankings, which necessarily reflect the initial distribution of prestige and are a conservative (backwards looking) hierarchy-perpetuating force. Some top firms have 2000 lawyers but only hire from 15 law schools. Some boutiques only hire from four or five. They aren't selecting for brain power, if so they would go around to 100 schools and hire only the summa grads. They are buying resumes that say Harvard and Stanford because they think the clients care. And the more those ivy kids turn around and post about how everyone else is too dumb to comprehend their complicated deals, the more the merit mythology gets perpetuated. The cost of first tier legal services is going up because the impact of not having that top rate legal service has gone up with the increased regulation and advances of "law" into so many areas of business. Make a bad business decision, not only does the company, BOD, and CEO get sued, they might go to jail. Want a complex M+A (they are all mind-numbingly complex now in ways that were ot considered 20 years ago)- then get a firm that can follow the complexity in the short time period allowed. Add to this situation, ever increasingly complex laws and it takes specialist who have experience and the brain power to sort through the fog of a "legal war" and craft a first rate position. Having seen the results when the other side is not as specialized or as experienced, or as smart- they often don't make the best legal arguments and accept a disadvantage in the legal battle. When it is top tier firms on both sides- it may look easy. What the big companies are buying is brains and experience, not prestige. Yes Virginia there is a big difference between the quality of services at the top of the AMLAW 200 and a fim not on it in too many areas of the law. This is reflected in the associates- the firms are buying brain power and a willingness to work. In a world where those two qualities can pay much more than the legal field (finance, business)- it takes larger salaries to get associates with those qualities. The top schools select for brain power- what else is the LSAT measuring? There are only so many smart people going into law- and almost all attend a top 20 law school. 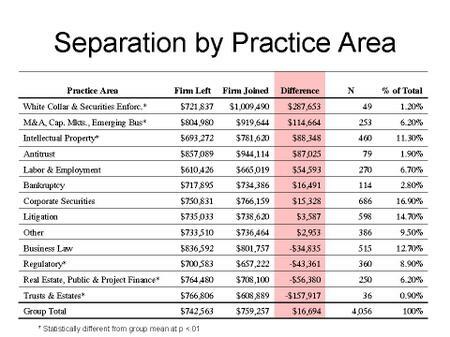 Where does tax fall on the Separation by Practice Area chart? Well, now I have read the article. It has some interesting ideas, but I think the author would benefit if he had spoken (which he doesn't seem to have) with actual practicing lawyers at middle-market firms (i.e., Amlaw firms 21 through 200). For instance, a significant amount of transactional work at those firms is done on a fixed-fee basis, and an even larger portion on a "soft fixed-fee" basis (i.e., it is understood that if a matter runs significantly over what would be normal for a matter of that size, the firm will absorb some of the cost). Obviously, the managing partners of these firms don't publicize that sort of thing, since it would mean admitting that the firm isn't Cravath. Also, I'm not sure that a permanent stratification of practice areas is really in the offing. Hot (i.e., profitable) practice areas change over time, and those lawyers in fields that have prospered at any given time will be moving up the firm ladder, while those in fields that have declined will be moving down, but it won't be the same fields in 20 years from now. 1) Firms take more cases per lawyer now. 2) There are no incentives to work efficiently or avoid duplication on an hours system. 3) More hierarchy creates more churn. Computers don't help you when ten partners and 20 associates are sending revisions to pleadings. 4) e-Discovery means faster review per document, but there is signifcant supervisory overhead and the raw number of documents that get produced goes up ten-fold. 5) Honestly, westlaw isn't God's gift to legal research. For a lot of subject areas I can still beat the computer with a well-indexed treatise. Make a computer that actually reads all the cases it finds for me and we'll talk. The other thing about computer research, combined with the long-term trend of courts publishing every case, is that you frequently end up finding and reading 20 cases on both sides of even the most trivial issue. I do not believe technology has improved the practice of law, though it has certainly made it more mechanical (and empirical). Let me clarify my question about increased technology and its impact on legal fees, because it seems like responders missed the point. Because of westlaw and computers, it takes far less time to research, write, edit, and finalize memoranda and pleadings. And yet, the lawyer's time at the office has only increased, as have legal fees. Why is that? The real question is how does BigLaw get away with charging such high rates for junior associates that are just reading and coding emails from home? My big law buddy gets paid well but he hasn't done anything beside discovery production for over 2 years. As a solo slacker in the same two years I have many filed complaints and motions, argued and won in federal court, and so on. I am no expert but I am much further on way to being a real lawyer than many big law associates. And I enjoy the work. There is no arguing that the folks hired by big law are bright. However, I think Big Law firms are honey pots that keep smart over-achieving lawyers off of the streets, and out of the courtrooms, so I can have an easier time of it out here in the real world. "Renown" is a noun, not an adjective. The word you are looking for is "renowned." When looking at whether the ABA should decertify law schools, please keep in mind that most lawyers don't work for the Amlaw 200 firms or practice corporate law. Large numbers help rather ordinary people with very real life problems like lease disputes and traffic violations. There's nothing wrong with that. Second, the impact of technology is a double edges sword. Sure, computerized research cuts down on research. But modern word processing now makes it possible to easily make a partnership agreement take up 75 pages that used to be accomplished in 15 pages. Provisions that were never addressed a generation or two now contain terms with great specificity. The result is creating or reviewing one of these agreements (or a purchase or merger agreement) take considerably more time than they once did. > Look, if the Marines can get 18 year olds to keep signing up, even though many graves of prior offer-takers are conspicuously displayed, how hard is it to find 25 year olds willing to take $160k? Part of the allure of the Marines is that there are conspicuously displayed graves. The Marines offer meaning and significance. Yes, how absolutely horrible that small markets have a local law school to turn out grads to the local market and to centralize CLE instruction. I can see the argument for closing law schools in cities that have four or five. (Boston, New York, D.C., Chicago) But here in flyover country, if the schools ranked over 100 get closed, goodbye to having more than one law school in a state. Going to one of these schools, I realize that without an LLM from a "prestigious" school or years of high class experience I will never see the inside of big prestigious white shoe firm. But that doesn't mean that my education is worthless or that my school should be closed simply to create an artificial shortfall. And really, has US News and World Report so brainwashed people that a school's reputation is only as good as a number? JRH is also incorrect, I think, when he says law firms lose face when cutting associates. No one cares or remembers one year later. When people decide whether to take an offer, the bad outcomes for your predecessors are discounted, explained away, denied, or even weighed against the opportunity presented. Look, if the Marines can get 18 year olds to keep signing up, even though many graves of prior offer-takers are conspicuously displayed, how hard is it to find 25 year olds willing to take $160k? People are spot on about closing all those law schools below the top 50-100, though. Those places are a disgrace. 1. Where are the GC's going to go? These people owe fiduciary duties. If things turn out badly, a GC is going to want to be able to say that he hired a reputable -- albeit expensive -- firm. Why would a GC ever go for the "low cost leader" and put himself on the line? 2. Your post, while excellent, completely overlooks the cost of law school. 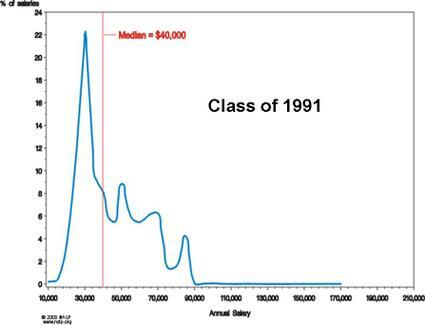 Twenty years ago salaries looked far different; let me assure you, law school tuition was different as well. Most students graduate with six figures of debt. 3. First-mover bias: firms that cut associates (e.g., Sherman) or pay below market rates will lose face. Period. Law is a prestige oriented field and reputations change slowly. When profits are booming, why fight the status quo? An even more interesting and relevant article would focus on the dubious tactics lower-ranked schools use to perpetrate the (mistaken) belief that their students will emerge on the good side of your bi-modal "curve". Westlaw/Lexis have probably increased costs because of the completely unreasonable expectation of partners in the pre-Westlaw generation who believe that absolutely anything can be found with a simple search. I've spent hundreds of hours searching for things that simply do not exist because a partner wants to include a completely unsubstantiated claim in a brief. Mike McDougal is absolutely right. It's the labor that's the key. And it's the QUALITY of the labor that is the sole source of competitive advantage for law firms. Without a perception of quality, there is no way for law firms to pass increasing costs on to clients in a competitive market. So partners are forced to bid higher for the top law grads in order to attract more of them to do more work -- and thanks to globalization there's never been more work than now. ...and then associate to partner ratios have to go up to keep the profits per partner high enough to prevent partner defections. Which is fine for a while... until associates start to come up for partnership who have never met clients because they've spent the last decade doing document review or due diligence. Whoops. Kudos to Bill Henderson for pinpointing lack of training as the main problem for stability of the current business models. Big firms can dress it up as much as they want; but classroom lectures do not make up for hands on experience with clients or in court. This talk of books and Lexis/Westlaw is horribly misguided. The costs of legal research are a miniscule portion of the cost of providing legal services. So, yes, Russ, the cost of legal research is a downward pressure. But downward pressure on a miniscule input doesn't change the total cost much. The vast majority of the cost of legal services is labor.